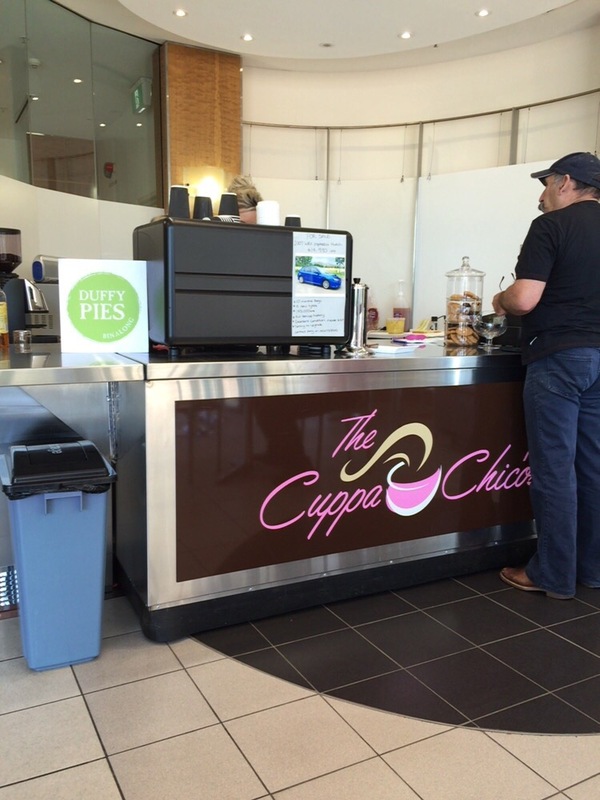 For months I was looking forward to a Greek restaurant finally opening inside the Hellenic Club in Woden. My email subscription to the club was a constant weekly reminder for me to go to Orexi, the highly anticipated new Greek eatery bringing with it a promise of upmarket food by an international Greek chef- Yiannis Baxevanis. To my surprise, during my weekly brief scroll down the club’s email, something caught my eye which made me scroll back up and re-read the text. Something was different and it took me a brief moment to realise that Orexi’s banner was replaced with Fillo’s Taverna and bar, which started trading last night. I started typing in Orexi’s website, the page could not be found. I searched the club’s site; no trace of Orexi. It would almost be like they never existed, except for the mixed reviews online as recent as last week. Looking at Fillo’s menu, there are plenty of things I want to try as it has a lot more range than when they were at The Hamlet. I might have to try it sooner rather than later, just in case they get replaced. Of course it did…As soon as I left Canberra, all these exciting things open/happen. 4. The Duxton is hoping to re-open its doors later this month to show off their newly renovated bar which will include a roof top terrace! 5. The Forage– 22nd October 2-7pm I’m missing out on the last one of the year 😦 **update- due to bad weather The Forage has been postponed until 12th Nov 2016! 6. 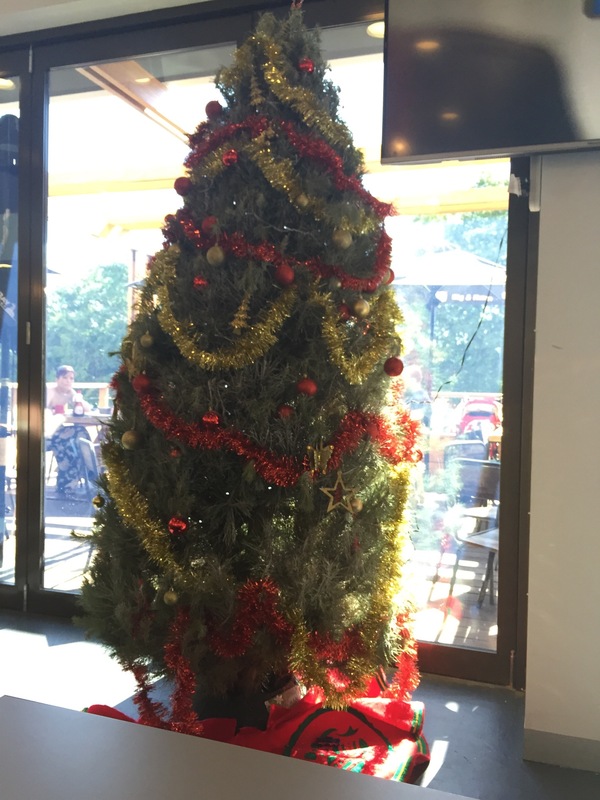 Molto down in Kingston foreshore are finally doing wood fired pizza again! I know I’m probably not going to get any sympathy for missing out but I hope you all enjoy what is on offer in Canberra while I’m away. Seriously, when did that happen? A follow on from my previous post “What? When did that happen?“, I am still finding myself uttering these words as my grip of the Canberra dining scene seems to slowly be slipping through my fingers. Okay that was just a menu item, their actual name is No. 10 restaurant and bar. According to their Instagram account, the first week of October is when they plan to open. There are plenty of things on the menu that have caught my eye, check them out here. Apparently for ages! I drive past it all the time and always assumed it was there but now something new is taking its space. Hopefully not long to go. Technically this hasn’t happened yet for the public, but my friend was lucky enough to attend a soft launch and I cannot wait to eat one of everything from the menu. See a sneak peek from Michelle here. Or not paying their phone bill, I can’t tell since their phone line is disconnected. This was also on my ‘to eat list’ but I never got around to eating there and now it looks like I never will. Does anyone know what happened to this place? I never made it to Rockin’ Ribs after Victor died but now the whole place is completely empty and available for lease. All the BBQ places seemed to have closed up shop in Canberra. 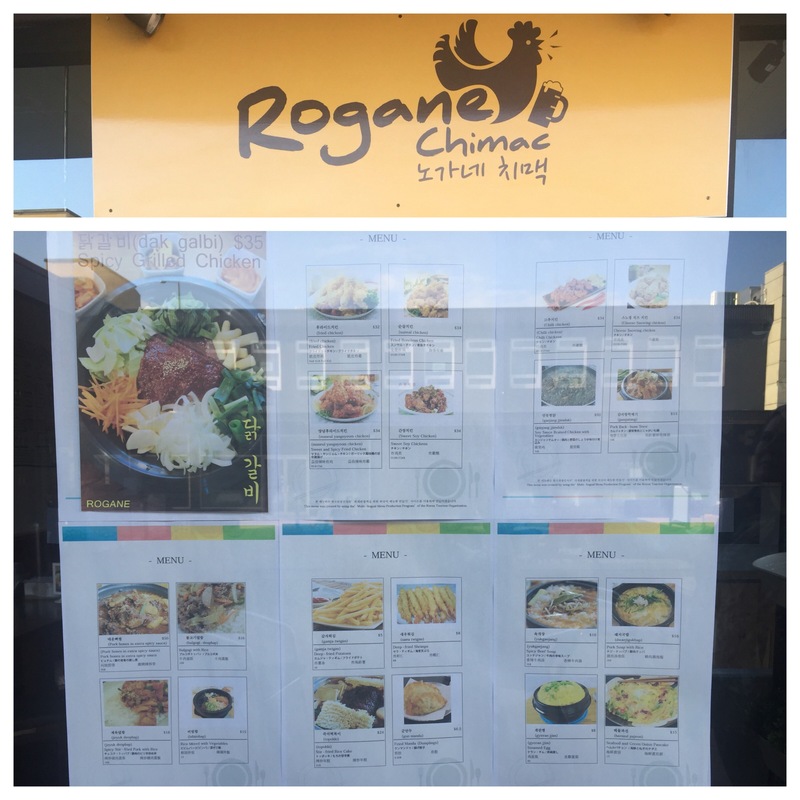 I recently walked past and saw signs for Rogane Chimac opening next to Kingsland. I don’t know when it will open (or if it has already), but it didn’t look like it was far off. They have more than fried chicken, but does it really matter? Now this is starting to show how little I venture into Civic and I’m probably the last one to know about this, but Gus’ cafe has been closed since around June(?!?). Gus’ has been around for so long, I was shocked to hear that it closed. According to my friends Mills and Grills have been open for ‘a long time’, which really means I need new friends or a better radar. They are loving their pizza but I want to try out their ribs. Check out the menu at here. It is called Helix bar and dining and located inside the Vibe hotel and a lot of reviews say it is over priced and the service is sub par. It doesn’t sound like a place that I want to rush out and try. This is why you bring friends along, you get to try more of the menu. Arancini fried risotto balls filled with porcini mushrooms with napolitana sauce, fresh basil leaves (3 for $16.00). I noticed the ‘holes’ in the arancini as soon as they were put down in front of us. I found that the risotto mixture was too sloppy to make a perfect arancini ball without it crumbling. The interior was nice and salty with a district mushroom flavour but I was hoping for a more cheesy filling. 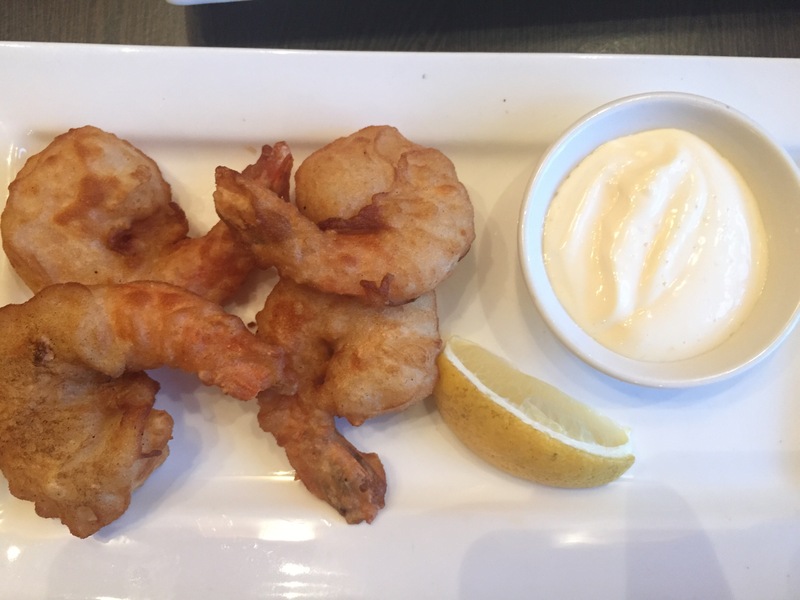 Crispy prawns lightly battered, golden fried, served with lemon wedge and lemon mayo (4 for $16.00). Despite being favoured by the other guests that I was dining with, I was impressed with the size of the prawn but I didn’t think there was anything special about this dish. Pappardelle fresh ribbon egg pasta, traditional slow braised veal and pork bolognaise, grana padano ($22.00). I was very tempted to order this as I love pasta. I found that the sauce to lack some salt and found it overall a bit bland but the pappardelle pasta was fresh and was fantastic. Pork skewers marinated with garlic, lemon, oregano, olive oil with spanish onion, tomato, tzatziki and pita (2 skewers $26.00). I don’t usually see pork skewers as an option on a menu, but these had a lovely char-grilled flavour whilst remaining succulent. It seemed like a complete meal because it was served with a small salad and bread. Chevapi char grilled skinless sausage made of veal and pork, with spanish onion, feta and ajvar (300g $22.00). The chevapi was nice on its own but it was the perfect balance of flavours when you added a bit of onion and feta with every bite. Again I found the ajvar a bit bitter so I avoided dipping the meat in it. I thought as a main, it was a bit sad that this didn’t come with some bread or a simple salad to balance out the heaviness of the meat. Bowl of chips ($10.00). Unlike the skewers, the chevapi sausages were served on their own and it was suggested to get a side of chips or bread to balance out all the meat. I thought the price was a bit steep for chips but fortunately they were delicious because of their crispiness and seasoning. You can’t tell from this angle, but the bowl was pretty deep. Pita ($4.00). This bread was warmed which quickly turned cold and brittle. I think $4 is a bit steep for one pita bread, I should have just borrowed some from the skewers plate, but they said that they made it on site so I was curious to try. Gelato panna cotta, white chocolate and raspberry, salted caramel ($10.00). I really liked the salted caramel gelato over the other flavours but TimmyC really enjoyed the panna cotta, it goes to show each to their own. Palacinke Balkan style crepe filled with Nutella served with bon bon rocher gelato ($10.00). I felt that this ‘crepe’ was too thick and since it was presented in a rolled cigar, it made it feel even thicker, heavier and too sweet in one mouthful. If it was even slightly thinner, it wouldn’t feel as doughy in one bite. Krofne European donut filled with raspberry jam and icing sugar ($4.00 each). This reminded me of a Nanna’s frozen jam doughnut, but fresh. The sweet centre was at a good ratio to the doughnut so it wasn’t too sweet, the doughnut itself was nice and fluffy in texture. These are made in house and they are definitely tasty when they are fresh. A soft fluffy pillow encasing some delicious jam, that’s how I would describe this dessert. We found the staff very friendly, knowledgeable and efficient. It is nice to have a restaurant concentrating on Mediterranean cuisine in the area. I would come back and try more unique dishes I couldn’t get normally in other restaurants. TimmyC and I are not morning people, but everyone has a price so when TimmyC suggested that we wake up early and go to Space to have breakfast, I agreed although our early morning progress would be negated by said breakfast and we would just arrive to work at the time as we would normally. Polenta waffles lemon thyme sautéed mushrooms, goats cheese, poached eggs, corn puree, salsa verde and truffle oil ($18.90). I thought the addition of dry ice and truffle oil to create a ‘truffle cloud’ upon serving was more for showmanship rather than for taste, but it gives Space a more theatrics side of things setting them apart from their sister cafe Ricardo’s. The waffles themselves were rather crunchy with a soft centre and I loved it paired with the mushrooms and sweet corn puree but I found the goats cheese flavour too strong. I would easily order this again if I wanted a unique vegetarian option. The truffle cloud presentation. Space benedict pulled pork croquette with poached eggs, beetroot hollandaise, pork crackling brioche crumble and pea puree ($18.90). I loved the interesting presentation of this dish and I can’t resist a croquette. The crunchy croquette coating which encased the tender pulled pork was brilliant although I wasn’t a fan of the pea puree. I was surprised to see that I found the slightly sour beetroot hollandaise really addictive and kept dipping my fork into it. Definitely a breakfast classic with a twist that is worth trying. Served with beautiful violets and perfectly cooked eggs. The dynamics and atmosphere of Space is really different to Ricardo’s, you can see that this cafe is more ‘mature’ and invites a different clientèle in that would be suited to the surrounding office buildings. I love the addition of this funky cafe to the south side and I would definitely recommend this to anyone for a great breakfast and lunch, although I am not sold on their cakes yet. I can’t wait to go back and try more of their menu. Read the blog post that my awesome guest blogger wrote here. I wasn’t able to make it to a breakfast at Space recently, so instead a fellow blogger kindly offered to write her experience. So here it is, Tales of a Confectionist’s first GUEST BLOGGER: the wonderful Serina from Ms Frugal Ears. How exciting! Her photos are crystal clear, she writes well and she wrote this much faster than I ever would have. Hahahaha, maybe we can make this a regular thing. Thank you Serina for sharing your experience and making us want to run to Space and check it out for ourselves! I’m heading off to Space. For breakfast. Only I’m not heading to outer space, but rather to a car park. In Woden. Space, a new café/restaurant by Rick de Marco of Ricardo’s fame, opened three weeks ago in the Skypark car park. Yes, in a carpark. A pretty modern and funky NEW carpark in Woden with 940 spaces and plans for a lightshow. It is an unusual place for a café, but not so unusual for someone used to working hard and taking risks. Rick opened Ricardos in Jamison Centre ten years ago when he was only 18. I remember Jamison Centre back then; I used to regularly forage at the Sunday morning Trash n’ Treasure market that the Rotary Club of Belconnen runs. Before the Jamison Centre refurbishment the area was a bit of a dive. I remember seeing Ricardos when it first opened and wondering if it would stay in business in such a drab environment. But Ricardos Jamison has flourished, so much so that on weekends you have to queue along the red carpet before one of the staff will grant you a pass in. It feels more like being an at exclusive nightclub than the family friendly and fun café that it is. Not that staff behave like brusque bouncers – everyone is utterly courteous and service is brisk. It is just extremely popular. The new business is not simply a new Ricardos. “I consciously chose to give Space a new name, a new brand,” explained Rick de Marco. “I opened Ricardos when I was only 18. This is like an adult version of Ricardos. I want to be able to experiment with new dishes, rather than having people wonder why things weren’t exactly the same as Ricardos Jamison Centre.” Rick also expressed passion for heading the revitalization of Woden to mimic what he was part of at Jamison Centre. 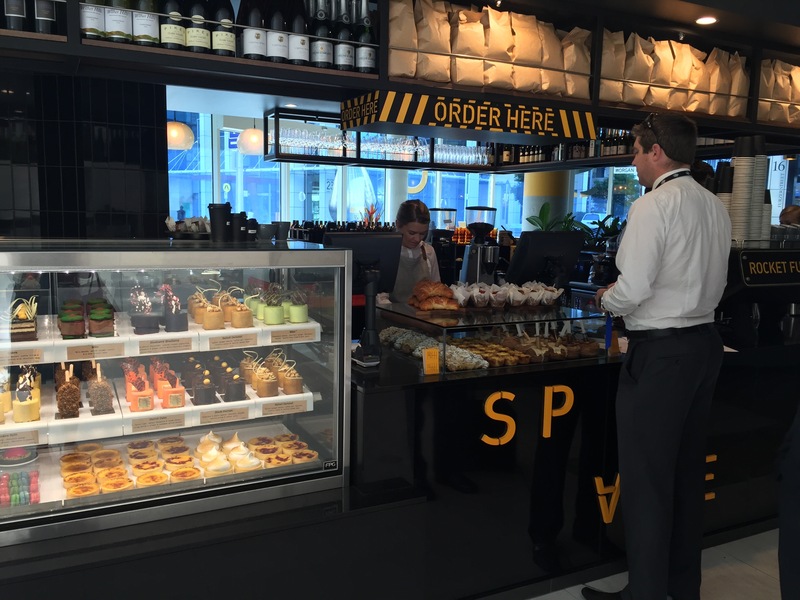 Before you ask – yes Space still does amazing cakes including Rick’s signature Golden Gaytime and macarons. But the feel is slicker, more modern, with subtle references to the ‘car space’ theme throughout. And Rick is even more courageous with his food creations. My visit was hosted by Rick as part of a social media event to showcase some of Space’s signature all-day breakfast dishes. Space does make some standard style bacon & egg type dishes, and these are also popular – according to head chef Russell, although Space has only just opened it typically cooks around 1,200 eggs on a weekend. We began with vegetable fritters ($18.90) This is kind of like traditional corn fritters your mum probably made only more upmarket and served on beetroot humus and corn cous cous with salad and poached eggs. Remove the cous cous and the dish is gluten free – chef Russell makes them with a flour made from chickpeas, amaranth, quinoa and arrowroot. He also said that during the week this is by far the most popular breakfast item. I wanted to try more of the hot smoked salmon breakfast (hot smoked salmon, smashed avocado, coconut roesti, poached eggs and puffed grains, $18.90), but it disappeared quickly amongst our group. There was a substantial salmon serving and if ordered as a breakfast you would not leave feeling unsatisfied. I liked the gentle tea-smoked flavour, which was distinctive yet not overdone. I noticed owner Rick de Marco plating something up himself. “Does he interfere often?” I playfully asked. “We take a collaborative and cooperative approach,” answered head chef Russell tactfully. Rick is clearly a perfectionist, evidenced when he presented a plate of the most beautiful bircher muesli I have ever seen. Adorned by fresh fruit and flowers, the bircher muesli ($15.90) was surrounded by circles of yoghurt and blood orange curd and decorated with passionfruit caviar (perfect pearls made through a chemical emulsion process). And yes it tastes good as well, augmented with freshly grated apple. Then came the two spectacular dishes that have a creative wow factor that will likely put Space on the galaxy map. Space benedict ($18.90) incorporates the Golden Gaytime theme that Ricardos has become famous for as a dessert – but here it is a deep-fried savoury pulled pork croquette, served on a bed of beetroot coloured hollandaise sauce with avocado, poached eggs and pork crackling brioche crumble. I loved the crumble texture, liked the concept of the croquette but it is not my preferred choice for breakfast as it is a bit oily. Russell said that Space plans to make it with smoked trout in the future, which I think will be nicer. My favourite dish was, quite unexpectedly, waffles ($18.90). I am almost over waffles after consuming way too many while in Taiwan – usually they were overly adorned with fake cream and fake maple syrup and looked much nicer than they tasted. But these were savoury waffles made with polenta and cheese and served with a side of mushrooms sourced specially from a grower in Yass, with a liberal sprinkle of popcorn. And served with goats cheese, poached eggs, corn puree and salsa verde. Yet there is more – as they are served, the waiter (in our case Rick himself) poured diffused truffle oil over the top, which wafts out in a (safe) cloud of dry ice. Spectacular and fragrant. We were served soft cooked poached eggs, but Russell assured us you can order them well done or prepared a different way if you like. If you are hungry, I recommend the boysenberry hotcakes, with blood orange curd, freeze dried raspberry and white chocolate crumble with coconut mascarpone ($17.90). These were pretty, and also pretty filling. I would have struggled to finish an entire plate. Or perhaps I would have been greedy and managed the task – the hotcakes were thick yet inviting and moreish. Guest blogger details: Serina blogs about mindful frugality and low-cost recipes at www.msfrugalears.com and about Taiwanese food and Chinese postpartum confinement at www.taiwanxifu.com. She is an avid tea drinker and loves brunching with friends. She participated in a breakfast tasting at Space at the invitation of the owner, Rick de Marco. This was our plan B after Common Grounds in Gowrie failed to have pancakes available for the second day in a row. TimmyC had been raving about Woden Smoque‘s waffles as he had been several times without me. I love their huge Christmas tree. 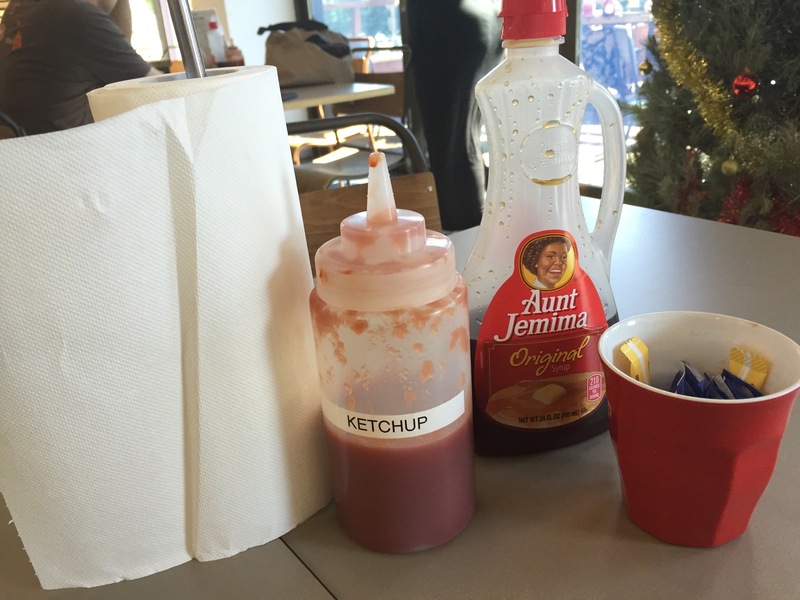 I’m not a fan of Aunt Jemima’s syrup as it is full of corn syrup but I like how there are condiments on every table so you can help yourself. Signature waffles~ Our signature American style waffles. We imported a speciality waffle iron from USA. All served with syrup. 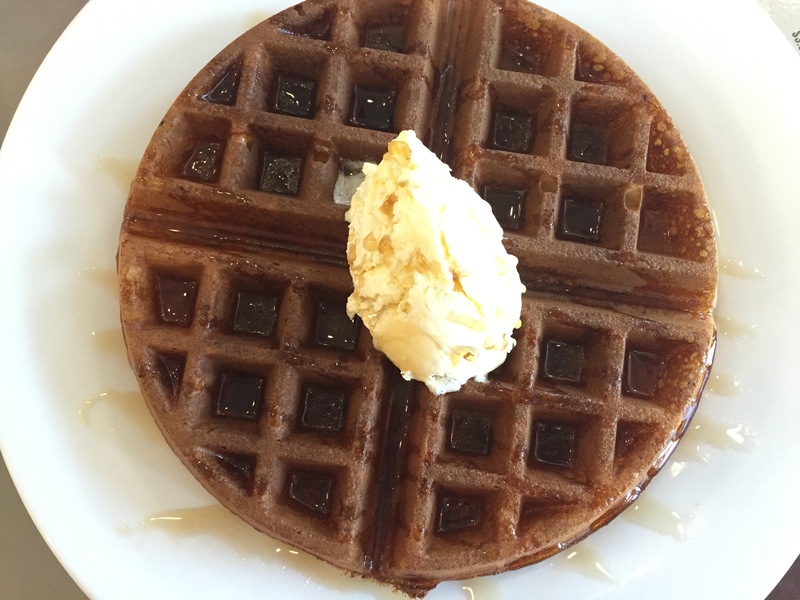 The Classic plain waffle simply served with Maple Syrup and honey butter ($8.90). To be honest, this was all I wanted to try but I didn’t want both of us to order the same thing. 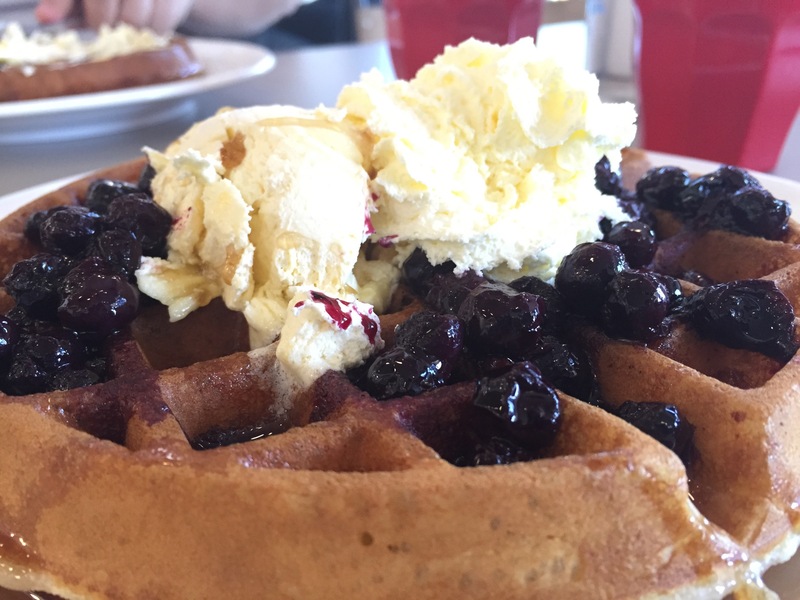 TimmyC said that his previous experience here was much better as the waffle came out crazy hot and the honey butter had completely melted overt the top. Today the waffle came out luke warm and the butter had to be pasted over the top of the deep welled waffle but it never really melted. The waffle itself was a little pancake-y and could have done with a bit more crisping. 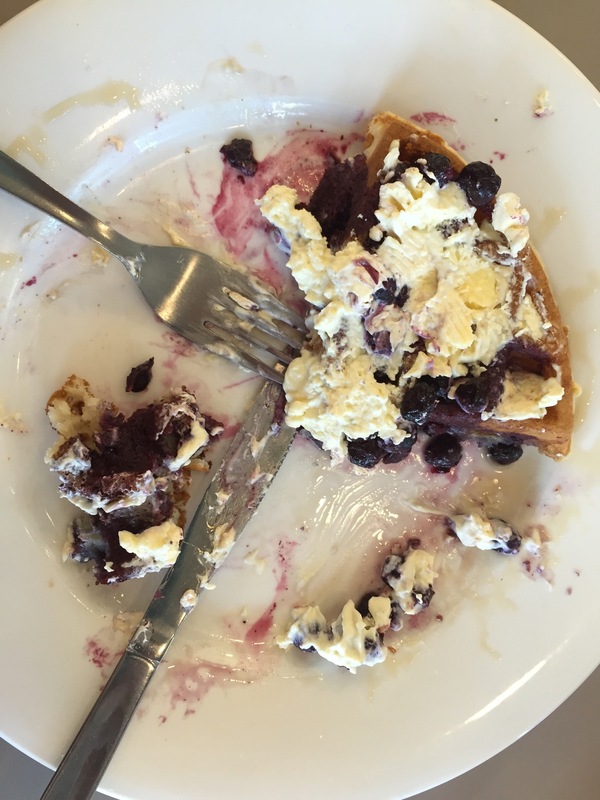 Blue Suede waffle blueberry compote, whipped cream and honey butter ($12.90). Basically the same as the classic waffle but it has an added blueberry compote and some whipped cream. I like how most of the berries retained their juicy round shape despite being in a compote. I couldn’t finish it because the butter that failed to melt was OTT and it felt like I was eating solid fat. It seems like food here is a little inconsistent if TimmyC had fabulous waffles (they were so good he ordered another serve) the previous week and this visit it was very mediocre. I had been here previously for their dinner menu, see that post here. All I heard was blah blah blah, Two Before Ten Jaffle Van!? Westfield with Earlybird Events presents the Bradley Street Festival, Canberra’s newest street event! See the Veronicas perform live alongside some of the best local performances including Kulture Break, Wassa Wassa from Red Hill, the Launch of Club Lime’s Kids Born to Move Classes, and more throughout the day. Former BMX World Champion Cam White will be performing stunts as well as signing autographs! Roving characters including Paddington Bear! There is plenty to entertain the entire family and a great way to celebrate the holiday season! For once, food wasn’t the forefront of my mind, winning was. We had a Seinfeld trivia night that was held at the Hellenic club for charity but first we needed sustenance. 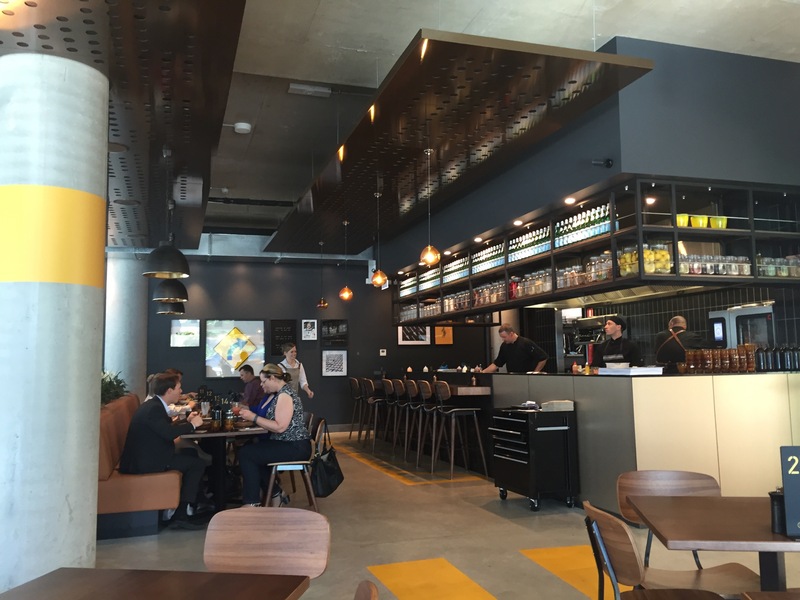 We headed to Smoque in Woden for their convenient location and smoked meaty food. 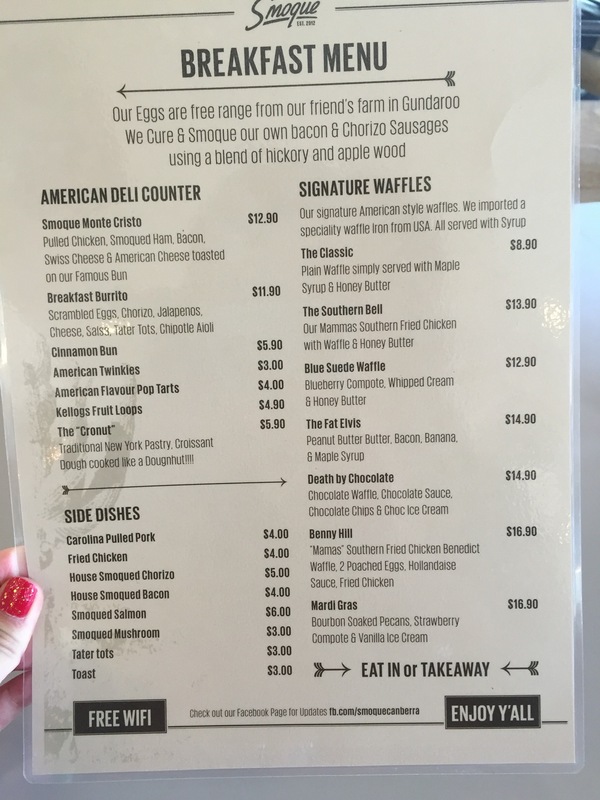 I didn’t envisage that my first meal here was going to be from the lunch/dinner menu because their American style breakfast was what intrigued me about this place but when the opportunity presented itself, I wanted to try a range of food. I made TimmyC share the BBQ trifecta with me even though he just wanted the pork ribs. Boneless buffalo wings ($12.90). Smoque Signature Texas Beef Rib (1 kg $34.90). Double BBQ Bacon cheeseburger 2x Angus beef patties, bacon BBQ sauce, cheese ($14.90). I think that is what she ordered, whatever it was, it looked really good and she ate it all. I found the staff pretty useless at the front counter and not particularly friendly. Needless to say I was pretty disappointed with my meal. I think I’ll just stick with the pork ribs and buffalo wings. If you didn’t know what you were looking for, you would probably think that this was a photo of something strange and out of the ordinary but what my eyes automatically zoomed to when TimmyC sent me this photo was the Duffy Pies sign !!! I immediately asked if there were any sausage rolls as they are in my top two for sausage rolls around Canberra (the other one is from Dream cuisine). They were sold out yesterday but will have more today, it is good to know that I don’t have to drive all the way out to Binalong to get one now. *This photograph was taken by TimmyC and used with his full permission. It is very rare that I get a chance to meet up with TimmyC for lunch during the work week but we made a date and I suggested dumplings (outside of a Tuesday! ), I used this opportunity to meet him at the Chinese Kitchen Dumpling House as we have not been since their renovation. I was running a little late as every man and his dog decided to also go to Woden Westfield and circulate around the car park during Friday lunch time. TimmyC chose a table on the outside which I preferred for photo lighting reasons, the inside decor looked very ‘old world Chinese’ but a little dark, crowded and noisy. The wait for service didn’t take long (it probably took longer to decide what to order) and after we ordered, drinks promptly followed. The first serving timing was super fast! Our rice with two BBQed meats was the first to arrive. It would have been annoying if two people who weren’t sharing the meal received their meals with such a time difference (we had almost finished the rice before the first set of dumplings came out), but we did request that whatever food was ready for it to come out ASAP. Two mixed BBQ plate with rice (Roast Pork and BBQ duck). I like this combination as it allows you to pick your favourite two BBQed meats accompanied with rice and some vegetables. I love eating the rice with the sweet soy sauce that usually comes with BBQed meats. I really liked their BBQed duck, after all Chinese Kitchen has been doing this for years so I knew they had their skills down pat, it was just a bit disappointing that the roast pork pieces are chopped so small, I don’t know if it is to give the illusion to make it look like more. Pan fried pork and chives dumplings (15 pieces $13.80). I knew the dumplings would be small so I had no qualms that we couldn’t finish it between the both of us. They came out super hot which was not great for my over enthusiastic mouth. I really liked their crispy pan-fried bottoms but I think I prefer my dumplings to be bigger. Shang Hai steamed pork bun (10 pieces $14.80). The steamed pork buns were not perfect but definitely in the top few that I’ve had in Canberra. It also came out very hot but because there is a little ‘soup’ that develops inside it, it probably burns you even more. The meat filling tasted okay although I think you could never go wrong with pork. I had to ask for soy sauce and vinegar which confused me a little as it is essential to dumpling eating, although I was disappointed when the vinegar had the colour of Apple cider vinegar when it should look red, so I stuck with the soy sauce for my dipping. I also would have preferred a Chinese spoon to eat these properly. The trick is to nibble an air hole to allow the dumpling to cool a little before consumption but all without losing the essential ‘soup’ inside, hence why a Chinese spoon would have been handy. I didn’t get to try much from the menu but I tried the essentials: bbqed meats which was always their specialty before the refurbishment and also their dumplings which is something new to them and they have concentrated more on after finding the demand was high in Canberra. I thought the service was fast and attentive before we received all our food, but if you wanted anything else after that (like sauce or spoons), you really had to wave your arm off before someone would come and attend to you. I received this email from Westfield Woden, unfortunately I won’t be in the area to check this out. I can imagine the area smelling amazing! What are you doing after work on Friday night? Jammin Da House Latte Art Champion. Enjoy the aroma of coffee, taste the competition lattes, sip on wine and bid on auction items to raise money for Project Origin all whilst you cheer on your favourite barista. If you are a barista (or know of one) wanting to compete, please pre-register now by emailing Dien@espressoroom.com.au or leave your details at Espresso Room. Treat the kids (and yourself) to a stick of deliciously sweet Fairy Floss. 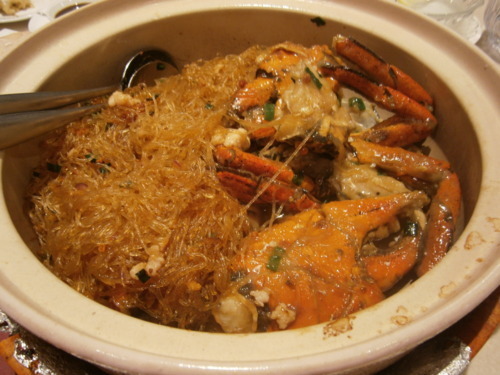 So yes I went back again within a month and had more mud crab cooked with ginger and shallots (with noodles of course). Like I said- once you try it, you’ll start to get cravings. 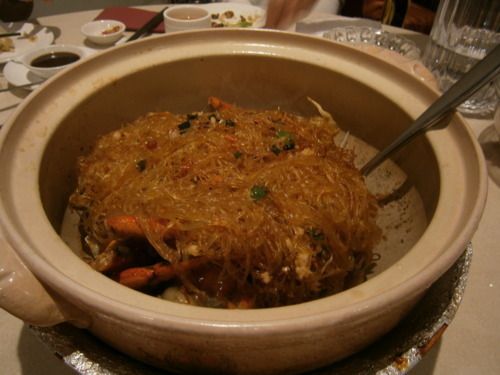 At least this time we mixed it up a little and also ordered a mud crab in a vermicelli hot pot. 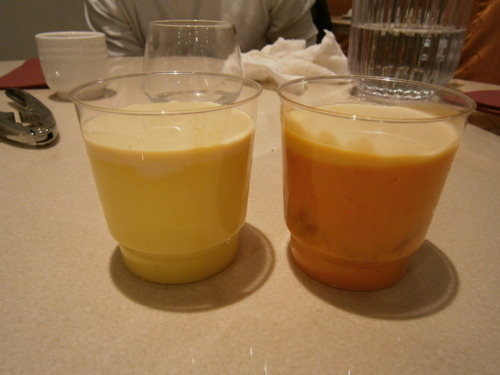 We also got dessert- durian pudding (yellow) and mango pudding (orange) served with carnation evaporated milk. Truely Asian styles. Yum!